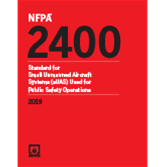 Utilize small unmanned aircraft systems (sUAS) in public safety and emergency response operations with confidence with the new NFPA 2400. The first edition of NFPA 2400, Standard for Small Unmanned Aircraft Systems (sUAS) Used for Public Safety Operations provides the foundation for departments to develop sUAS programs based on the most current industry knowledge and best practices. This all-encompassing standard covers the implementation, deployment, and use of UAS in the public safety community to enhance capabilities in inspections, search and rescue, fire scene efforts, and other operations. NFPA 2400 answers the call for a uniform standard for the use of drones by public safety agencies. This essential resource establishes standard procedures for utilizing state-of-the-art aerial emergency response robotics to enhance your department's capabilities. 4.4 sUAS Mission Objectives and Goals — Operational Needs Assessment. 4.5 sUAS Selection — Needs of the Public Safety Entity. 4.6 Concepts of Operations (ConOps).